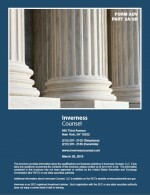 Inverness' culture is predicated on putting our clients at the center of everything we do. Several members of our team have worked together, and with the same clients for decades. Such long-standing relationships are a rarity in our industry, and afford us an invaluable perspective. This solid foundation makes our personalized approach possible, and allows us to better identify potential challenges, and effective strategies. At Inverness, our first step to crafting a personalized investment solution is gaining insight into what matters most to you. We meet with you, and your family - as well as your lawyers, accountants, and other trusted advisors - to help us better understand the broader sense of what is important to you now, and what may be important to you decades from now. Our team provides value that exceeds the capabilities of a typical Registered Investment Advisor. Our value is in our collective experience and personalized approach. The development of a personalized wealth management solution requires a thoughtful analysis of how risks and opportunities combine, react, and change over time. Tackling the toughest questions often leads to the most significant rewards. Your tailored wealth management program will be a blend of our Team's broad based knowledge, coupled with the valuable insights from your key Advisors. Through continued communication and collaboration, we will monitor strategies, invest with confidence, and discover growth opportunities.